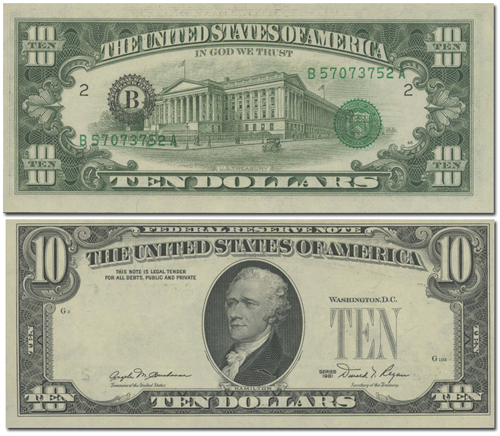 A double denomination note has differing face and back values, for example a $5 face with a $10 back. Double denomination errors are exceedingly rare and valuable. The number in existence is very low. If you find one on eBay or for sale from a source otherwise not confirmed to be knowledgeable, it is likely that the note is not genuine. Faulty alignment errors are characterized by once side of a note being properly centered, while the other is shifted to some degree. Shifting may be only minor or may be dramatic. These errors are relatively common and widely collected. Insufficient inking errors result from poorly or inadequately filled printing plates. As a result, the note displays an image that is faint or not fully complete. Like other currency errors, insufficient inking may be only minor, or may affect large parts of the note. Most errors of this type have insufficient inking of the 1st or 2nd printing. Inverted back errors might also be called notes with upside-down backs. This type of error is caused by a sheet being fed incorrectly (rotated 180 degrees) into the printing press for printing of the face (backs are printed first). Inverted back errors are not very common and command relatively high premiums. A blank back error note is one that has printing on one side, but no printing on the other. These errors are often caused by two sheets being fed into a printing press at the same time. Multiple impression errors usually display an image that appears “blurry” or “fuzzy”, and may occur when a sheet is mistakenly re-fed through the press after receiving printing, or a sheet staying in place after being printed and receiving a second impression of the same design. Obstructed printing errors occur when a piece of material (usually a stray piece of paper, tape, wrapping, etc) comes between the printing plate and the uncut sheet. The result is a portion of a note with blank area. Obstructed printings are popular with error collectors, with value increasing dramatically when the item causing the obstruction is retained with the error note. Offset printed notes occur when an inked plate makes contact with the bed, often the cause of no sheet being fed to the press to accept the intended ink. As a result, when the next sheet passes through the press, the area impressed onto the impression cylinder is then pressed onto the opposite side of the note. Like others, this type of error can range from minor to a complete offset, with the latter being more desirable to collectors. While a rational theory, note that the errors described or pictured here are not caused by wet sheet transfer, or ink transferring from still-wet sheets to other sheets. Back overprint errors are the result of an uncut sheet being fed into a press with the obverse of the note facing the overprinting press. The information printed by the overprinting press include Treasury and Federal Reserve District seals, district numbers and serial numbers. Such a note will be missing these elements from the front, and instead have each displayed on the back. 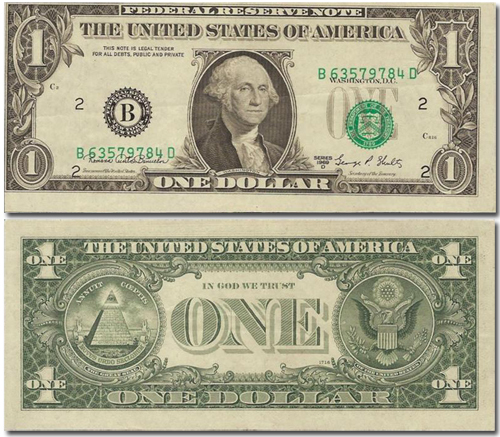 When a sheet is fed upside down relative to the existing face print, the result is the Treasury Seal, District Seal, District Number and serial numbers being printed upside down. Inverted 3rd print errors are not especially rare. 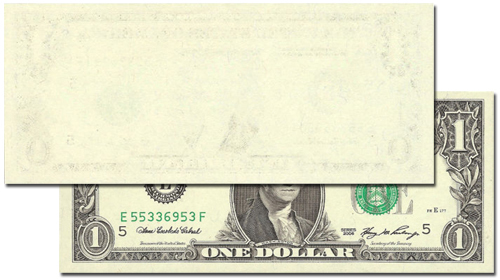 When overprints (3rd printing) occur when the serial numbers and seals are out of position, vertically or horizontally, and are so far from their appropriate position that they cover unintended portions of the note. For example, a District seal might be so far misaligned that it covers the portrait on the face of the note. Again, errors range from minor, to major, with major errors being more desirable to collectors. A note with a missing overprint is easily recognizable because the bill lacks serial numbers and seals. Similar to Missing Overprints, a note with a missing 2nd print is recognizable because the note is missing its face printing. Therefore no subject or denomination is displayed on the note. On regular notes, both serial numbers on the front of the note are the same. Mismatched serial errors are characterized by numbers (or alpha characters) not matching on the same note. There are several different causes for this type of error. Notes with more than one digit mismatched are more valuable than those with a single mismatched number. Additionally, notes with mismatched characters are more scarce than notes with mismatched numbers. When the serial number digits freeze in place or get otherwise stuck during the printing process, the result is a stuck digit or partially turned digit. After printing is complete, the uncut sheets of notes are sent to be cut into single notes. Like the previous printing process many errors can occur during the process of printing, ranging from minor to quite dramatic. Gutter folds are the result of the uncut sheets being sent through the press with a wrinkle or wrinkles in the paper. A gutter fold error note may have one wrinkle or multiple wrinkles. While collectible, these errors are relatively common. A printed fold occurs when an uncut sheet folds over and remains this way during the printing process. As such, these type of errors range widely depending on the size and nature of the fold. As the name implies, an ink smear error occurs when smears of ink are passed from the press onto a note. Ink smears are not hard to duplicate or fake, so be wary when purchasing.